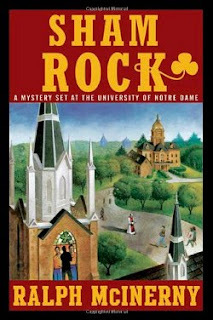 Sham Rock, Ralph McInerny's latest and (barring an unforeseen return to this vale of tears his supposedly dead characters were known to make) last book, is the thirteenth in his series of "Mysteries Set at the University of Notre Dame." As an alumnus, I must confess up front that this is my favorite series of the several written by the prolific fiction and philosophy author who passed away in January, but whether you are a "McInernyac" (n. A person who is crazy about the writings of Ralph McInerny) or mere novice in the workings of murder mysteries and/or Catholic universities, Sham Rock is a good place to begin--or end. I [taught] before Notre Dame described itself as a national Catholic research university. On the other hand, this does not mean McInerny (who miraculously finished this book before succumbing to esophageal cancer) was unaware of the fact this most likely was the Knight brothers' final act. Besides the story's "Your days are numbered" theme, characters such as Professor Emil Chadwick (like McInerny a professor at ND since 1955) and Father Carmody grouse about their mortality far more than usual. Chadwick recalls "There was a time, say from around fifty to seventy-five, when the solemn tolling of the bells marked...another colleague gone." But now "he was the sole survivor of those who had been on the faculty in his golden years...and there were times when he felt his own funeral had occurred" (pg.241). Meanwhile, Father Carmody, after earlier musing "His health was good, thanks to a lifetime of smoking (McInerny also smoked nearly up until the end) and intermittent total abstinence," later asks himself, "How long would it be before he was taken to the community cemetery from his own funeral Mass?" (pgs. 19, 240). Indeed, as the various members of the class of 1989 descend upon South Bend for the funeral of their former friend, the book almost begins to elicit the feeling of the final episode of "Seinfeld." But unlike that "comedy about nothing," the tragedies in Sham Rock change its characters for the better--although McInerny does takes delight in putting the monk and pulp fiction writer on even moral ground. After Philip Knight arrests the usual suspect, Roger (think Aquinas, only wackier) catches the unexpected but correct murderer, trapping him with a golf cart maneuver that would make Caddyshack jealous. Fittingly, the tale ends not with a winter death, but with a Father Carmody baptism of the fiction writer's son and the campus' return to springtime, and the hope that springs eternal. While many in the ranks of the academic intelligentsia (including some among the Catholic elite) may scoff at the notion of reading a mystery novel, it may not be coincidence that McInerny's last book was fiction instead of fact. Like Chesterton, McInerny (who almost single-handedly will be credited for reviving the Catholic mystery genre that G.K.'s remarkable Father Brown series started) realized that there is a time for apologetics but also a time for puns. And, if this be true, why can't puns also be used to lead people to Christ? McInerny's A History of Western Philosophy, Vols.1 and 2, are profound Catholic philosophical works, but they are not for everyone. Sham Rock is. Buy it (or Upon This Rockne, Lack of the Irish or any of the Notre Dame mysteries) and give it to the contraceptive Catholic, literalistic Protestant, or relativist atheist you know--but make sure you read it first. Then we all will realize that all we need to turn his fiction into reality and return Notre Dame (and the Catholic Church as a whole) to Our Lord and Our Lady is a few more men like Roger Knight--and of course, a prayerful assist from the saints, including heaven's newest mystery writer himself.